I knew I was going to love this book the moment I opened it. There was no Chapter One…turn on your computer, Chapter Two…make sure you have administrator rights, blah, blah, blah. NO. Instead, Matt starts with “10 Things You Need To Know About Compositing.” Wham. You get the good stuff right up front. Priceless. Instead of waiting until you’ve read the whole book, you are exposed to the key points to keep in mind while you are shooting your subject as well as while you are selecting an appropriate background photo. So, when you actually start Chapter One, some 25 pages later, each time a key point is mentioned, you’ll have a mini “ah-ha” moment when you can pat yourself on the back and say “I knew that.” While I’m not a trained educator, I can’t help but think that will really enhance your retention of the concepts and be very valuable to the learning experience. Since compositing requires at least one photo to be cut out and dropped into another photo, Matt uses a good amount of pages showing some great tricks that really simplify the process. With his recommendations, you’re going to become a big fan of CS5’s improved Refine Edge and Edge Detection features. Matt stresses the importance of keeping the same relationship between your shooting position of the subject and the background. For example, if you were kneeling on the ground, shooting up at a football player, that photo would look really strange if you tried compositing it with a photo of a football stadium taken from the top row. Your camera position should be in the same place for both. Matt shows you his preferred method – it’s really quite simple. Chap. 5 deals with shooting multiple people individually and making them look natural when composited together later. Chap. 7 has just the right setting for grabbing those small details of a city skyline. Chap. 8 shows a great composite of a concert scene that would be extremely difficult to pull off in the field. It also reinforces my thought that you ought to shoot stock shots of every concert venue you go to before the action starts, so you have good background stock images to use later. Chap. 10 may be a favorite as you learn how to create the typical movie poster. So who wouldn’t want to see themselves as the hero on a movie poster? Chap. 12 shows how to make those sports template backgrounds that are so popular. You’ll be amazed how easy it is to create stuff you used to buy for $10 or more each. Chap. 13 lets you take that one killer photo and use it multiple times to make a single-photo composite. Hey, if it’s that good, why only use it once? 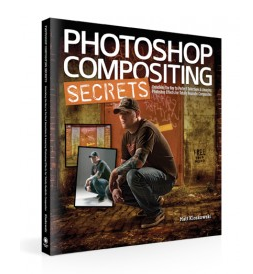 So, like if this book didn’t have enough good stuff already, there’s even an online tutorial where Matt and Scott Kelby show some of the highlights of the book as well as discuss plugins, tablets and other things that help with the compositing workflow. If you even have one compositing project to do this year, you won’t want to miss this book. It’s really that good.